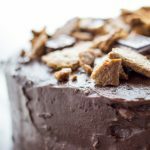 A delicious and rich chocolate graham cracker cake, perfect for birthdays and other occasions. Oil and flour two 9" baking pans and set aside. Add all cake batter ingredients except the boiling water into a mixing bowl. Beat by hand with a wire whisk, until batter is completely combined and smooth. Add the boiling water and whisk just until blended. The batter should appear quite watery. Evenly pour the batter into the prepared pans. Bake until a toothpick inserted into the center comes out clean, about 30 minutes. Cool slightly for 10 minutes. Invert cakes onto a cooling rack to cool completely. It is done cooling when the cake is cool to the touch, about 2 hours. If the butter is not already soft and warm, microwave until it is soft but not liquid - about 25-30 seconds if it's refrigerated. Beat butter in a medium-size mixing bowl until creamy. This is easiest with a wooden spoon. Add in everything else and beat until smooth and creamy. Separate into 2/3 and 1/3 portions for the outer frosting and interior frosting, respectively. Keep oven at 350 F.
Crush graham crackers to medium chunks - use a ziploc bag and rolling pin or mallet, or hands; don't make them too fine. Melt butter to liquid and pour over the graham crackers in a medium bowl, then gently stir until evenly coated. Spread the buttered graham crackers onto a baking sheet and bake for 8-10 minutes until toasted light brown. Break the Hershey's bar into 1/2 squares or smaller. Set aside half of the graham crackers and Hershey's for the filling, and save the rest for the topping. Once the cake layers are completely cooled, slightly trim the tops level, slicing horizontally, and brush away the crumbs. Carefully set the first layer on a cake plate, upside down - a cooling rack may be of help to flip. Place strips of wax paper along the edges to keep the plate from getting messy. Spread 1/3 of the frosting over the top of this layer, starting in the middle and spreading outwards. Evenly place half of the graham crackers and Hershey's pieces on top. Add the second cake layer, upside down, on top of this frosted first layer, then press down gently. Frost with 2/3 of the frosting, starting at the center and evenly spreading out and down from there. Sprinkle the remaining graham crackers and Hershey's pieces on top. Remove the strips of wax paper. If possible, allow the cake to sit covered overnight in the refrigerator for best results.